Also see these favourite quotes. This quote has been floating around for years. 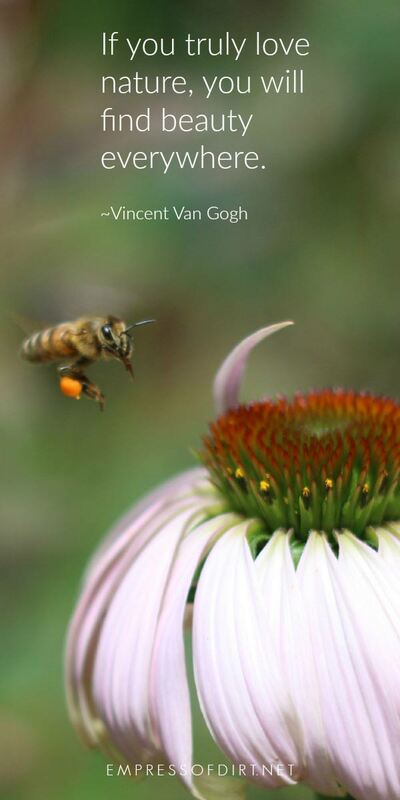 I have no idea if Van Gogh actually said or wrote it, but the sentiment still holds. I was thinking about it recently because the message is rooted in assumption that nature will always be available for us to enjoy: something we cannot take for granted today. Before the Industrial Revolution, people probably never even conceived of the idea of nature actually being irrevocably destroyed or forever changed. In those days, natural resources were, for the most part, renewable. Not because people took extraordinary care of the environment (they didn’t) but because there were not enough people or industries to overpower things yet. We’ve never been a species that considered sustainability simply because we never had to. Until now. And so, back then, if one truly loved nature, you could find beauty everywhere, because nature was everywhere to be found. If you have a few minutes, here’s some poignant videos, combining the urgency of our situation with some beauty and, perhaps, hope. A lot of people don’t seem to know that our oceans are clogged with plastics (and other floating trash) and it’s having a horrific effect on wildlife (and the cycle of life). I live in a rural area with a low population, and, when hiking, I find creeks with masses of disposable plastics clogging the water ways. It’s truly shocking. Following the earthquake and tsunamis in Japan in 2011 and consequent damage to nuclear power stations, radioactive areas were evacuated and deemed too dangerous to occupy. One man stayed behind to care for the abandoned pets and farm animals. We need nature. Nature does not need us. One of my favourite videos! Nature. Patterns. Math. Beauty! You can see more on the Fibonacci sequence here. Wow! Powerful message that needs to be heard. It’s so easy to fall into the pattern of consumption and waste. I needed this- thank you!